Enterprise agency, Nwes is celebrating after adding a further award to their impressive haul, having been announced as ‘Client of the year’ by the Norfolk Constructing Excellent Club. 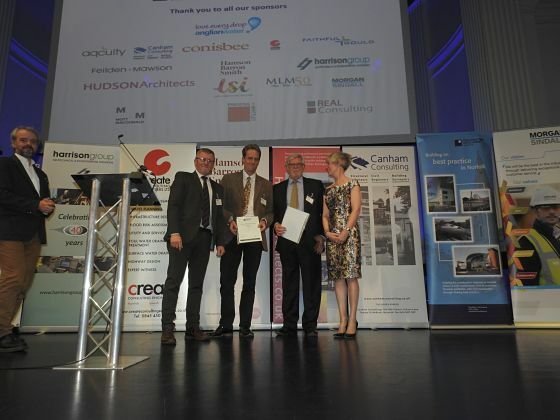 Nominated by Feilden & Mawson, architects for the Nwes development of the King’s Lynn Innovation Centre (KLIC), Nwes received the accolade, which was presented to Strategic Director, John Balch by Catherine Guelbert and sponsors REAL Consulting, at the ceremony at OPEN in Norwich on Friday 21 April. The Construction Excellence, Norfolk Club strives to maintain the highest levels of innovation, best practice and productivity, and represents the leading construction businesses and industry professionals across the County. The honour was yet further recognition for Nwes’ flagship business centre in West Norfolk. Developed in partnership with New Anglia Local Enterprise Partnership and King’s Lynn and West Norfolk Borough Council, KLIC is the latest innovation hub to be delivered by Nwes, offering long-awaited state-of-the-art commercial workspace, business support, access to finance, and business events in West Norfolk. Nwes Strategic Director, John Balch says. Tenants and clients of the King’s Lynn Innovation Centre benefit from top-specification office space, modern meeting and conference rooms, and an optimum working environment equipped with the latest technology. Services delivered by Nwes include high-calibre 1-to-1 business advice, mentoring and innovation support to accelerate business ideas. . Additionally, Nwes can also provide access to financial sources and funding opportunities, providing the tools for local entrepreneurs and start-up businesses to flourish and further strengthen the local economy. As part of the local Enterprise Zone, tenants of King’s Lynn Innovation Centre also benefit from reduced business rates, superfast broadband, and ‘easy in, easy out’ tenancy terms. A new coworking suite and virtual office solutions are also available.